A less than 1-star review of the 2nd edition of My Splendid Concubine that was posted on a Blog, Two Americans in China dot com [December 9, 2012], and on Amazon.com is the focus of this post. This review ran for 1,145 words. It took me a few months to decide to write a response, because it meant digging through thousands of pages of research—most of it from primary source material, Robert Hart’s journals and letters. In addition, it also meant attracting the wrath of mostly anonymous Internet vigilantes (cyber bullies) that allegedly think they have a moral duty to attack any author that responds to a review of his or her own work no matter how misleading that review might be. I have no problem with a negative review—even if it is 1-star—that is honest and does not resort to reckless and false claims to influence readers, but Amanda Roberts’s review of My Splendid Concubine may be, in my opinion, a reckless review, and I want to take advantage of my 1st Amendment rights as an American and have my say regardless of the mostly anonymous-cyber bullies who would probably vote “NO” in an attempt to bury this if I were to post it on Amazon.com. Roberts says, “Writing a book is hard. As a writer, I know how difficult it is to put the pen to paper and put what you have to say out there for the world to see and then be ripped apart. I try to be fair in my reviews and, even when they aren’t very good, look for the positive and leave the choice of whether or not to read the book up to my readers. My reviews are my opinion – nothing more. My question is: Does that “moral duty” give Amanda Roberts (or anyone for that matter) the right to write a reckless and false review? If Roberts had read “Entering China’s Service: Robert Hart’s Journals, 1854—1863”—as I did using a highlighter and tagging pages—before writing her review or after reading the 112,538 words of My Splendid Concubine’s 2nd edition, she would know how reckless and false the claims she made are that supports her ‘moral duty’. This is far from accurate, because it would be years before Robert Hart went to work for the Chinese, and then several more years before he would have the authority and opportunity to dedicate himself to keeping the Qing Dynasty from going bankrupt. And Customs only raised about a third of the Qing Dynasty’s revenues. However, it would have been correct to say that while Hart was Inspector General the revenues from Customs were the only reliable source of money that the Qing Dynasty could depend on. In addition, as a Custom’s official of China’s emperor, Hart never worked in Hong Kong, a British Crown colony. Instead, he spent a few days in Hong Kong after arriving in July 1854. While in Hong Kong, he struggled—for the first time—to learn Chinese before being posted to Ningpo via Shanghai. In addition, Hart did not work as a Chinese Customs officer out of Ningpo. Hart first arrived in China not speaking one word of Mandarin and his job description was as an interpreter working for the British—not the Chinese, and for his first few years in China, he worked for the British consulate in Ningpo. Then on March 20, 1858—while still working for the British as an interpreter—Hart was transferred to Canton three years and six months after he arrived in China. Hart would not leave his job with the British to work for the Chinese in Canton until June of 1859, and his title would be Deputy Commissioner of Customs—not Commissioner or Inspector General. It wouldn’t be until November 1863—more than nine years after arriving in China—that Inspector General of Customs Horatio Lay, in Shanghai, would be dismissed (fired) and Hart would replace him. Actually, My Splendid Concubine covers a span of two-years and four months, and Hart meets Ayaou for the first time during the summer of 1855 near the end of Chapter 3 on page 59—19,665 words into the novel. It isn’t until Chapter 12 at about 50,000 words that Hart, Ayaou and Shao-mei come together as a family of sorts. By then we are 44% of the way into the novel. In fact, when Robert Hart meets with the Dowager Empress in 1908, he’s seventy-three—not 80, and he will die by age seventy-six in 1911. In fact, a quarter of the way into the first 112,538 words is about 88 pages, and the word “erection” appears five times or on 5.7% of the first 88 pages. It is a reckless false statement to claim that “almost every single page describes Hart’s erection in some manner” when more than 94% of the first 88 pages do not refer to his erection. In fact, the word “erection” is used only nine times on six pages in the entire novel. In addition, Ayaou calls his erection a “sun instrument” and that word is used six times. Together, “erection” and “sun instrument” appear 15 times or 0.013% of the time. Robert Hart would not be influential in China until he became Inspector General in 1863. The 2nd edition of My Splendid Concubine focuses on Hart in China when he was learning about China and how to speak Mandarin while giving in to the same temptations that led him astray while he was attending college in Belfast. Those few examples only touch on Hart’s battle with his libido and temptation. In fact, shortly before his death, Hart burned his journals covering about seven of the first ten years he lived in China starting with May 1855 when he went to spend the summer at the home of Captain Dan Patridge (real name), who was the principal agent of Jardine and Matheson, the largest opium merchant in China. What did Robert Hart do that motivated him to burn what he wrote that covered those years? What do you think an opium dealer would provide in the way of pleasure? On page 153, “Whatever may have been his bittersweet struggles with his Wesleyan conscience, the fact remains that God enters less frequently into his journal hereafter. Gone is the thought of being a missionary; there is less attitude of prayer and seeking divine help. Love of woman seems to anchor Hart permanently in this world with no need for keeping lines out to the hereafter. Too bad, because in the 117,000 word sequel, the word “erection” never appears, because Hart—as his own surviving journals show—has matured and is a changed man from the one who arrived in China struggling with his Wesleyan, Victorian, British guilt because in 1854, he was as horny as a room full of adolescent boys and a few years before his death, he did his best to sweep those years under the rug by burning seven years of his journals that cover his first decade in China. The reason we know about Ayoau is because they had three children together, and in 1865 Robert arrives unexpectedly in Northern Ireland with Anna, Herbert and Arthur Hart, and without Ayoau. Some historians believe Ayaou died in child birth (the theory that I prefer), but others claim there is a letter that proves he sold—or gave with a dowry—Ayaou to another man in an attempt to whitewash his reputation. We know that he took the children to Ireland where he found them a foster home, and Hart never sees those children again. If it had not been for those three children, I’m sure that Ayaou would have been banished from Hart’s edited and revised history too. How would you describe a man that may have sold the mother of his first-three children to another man and then takes those children halfway around the world from China to Ireland so their mother never sees them again? If this theory is true, what does that say about Robert Hart? Amanda Roberts, most people think for themselves. They don’t need someone on an alleged evangelical crusade willing to claim anything to achieve what she may see as a moral duty. Another word for this is censorship, and there is a long history of censorship linked to a moral duty to censor books dealing with graphic sexual topics. Maybe the truth is that Amanda Roberts is an alleged throw back to the Victorian era and would rather sweep the truth under the carpet that this historical fiction novel reveals and hide it—the same thing that Robert Hart attempted when he burned those journals. Ms. Amanda Roberts, as valid as your opinion is (for you), there are other opinions of this book that are just as valid. Disclaimer: No money was paid to bribe another person to write a positive review of this book or to honor it with a literary award of any kind, and I’m sure if we go to court with a judge, lawyers and a jury, that fact would be easy to prove. There was no guarantee of a response from any of these sources or what that response might be. My youthful dreams of 1968 eventually materialized into written goals and I never gave up. To me, giving up means failure. In fact, every journey of a thousand miles starts with one step. For example, no one has reached the top of Mt. Everest in one leap. They climbed one step at a time—some fail, some die, but many have made it to the top. That is why I’m writing this post. I’m tooting my own horn. However, it wasn’t a slam dunk. In December 2007 when I self-published the first-edition of my first novel with iUniverse, I had two goals—sell 500 copies by the end of December 2008, then keep promoting my work until reaching 3,000 copies sold with no time limit to achieve the second goal. By the end of 2008 (my first year as an indie author), My Splendid Concubine had sold 221 copies so I FAILED to reach my first goal by 279 books that no one bought. It would take another year to reach 500. In 2009, I left iUniverse and went independent with the 2nd edition of my first novel. By New Year’s Day of 2010, it had sold another 341 copies for a total of 562. We seldom if ever hear about the reality of success in publishing from the media, which usually trumpets only the biggest success stories as if there are no failures and ignores the horde of authors that never make it. If we use the half percent from iUniverse, that means more than 760,000 self-published books sold less than 500 copies. If we use the 3% from Xlibris, that number is 741,515.56 titles. From publishing facts found at Dan Poynter’s ParaPublishing.com, we discover how difficult it is for any author, traditionally or indie published to achieve success in publishing. My first and only book trailer – so far. If the “the average book in America sells about 500 copies“, that means a few authors are selling many books while many authors are selling only a few. (Note: You may find more facts such as this one on Poynter’s site). To promote my writing, starting in 2008, I was a guest on thirty-one radio talk shows, held several author events at brick and mortar bookstores, and have been on three virtual Internet book tours (the last one in June 2012). To achieve my promotional goals, I paid publicists to organize the major promotional campaigns. Then in 2010, I started to Blog and that was when my sales skyrocketed more than 1,000% selling more books a month than I did each of my first two years. However, when I started in early 2008, I had no clue how my work would be received. Being a pessimist, I was ready for the worst. 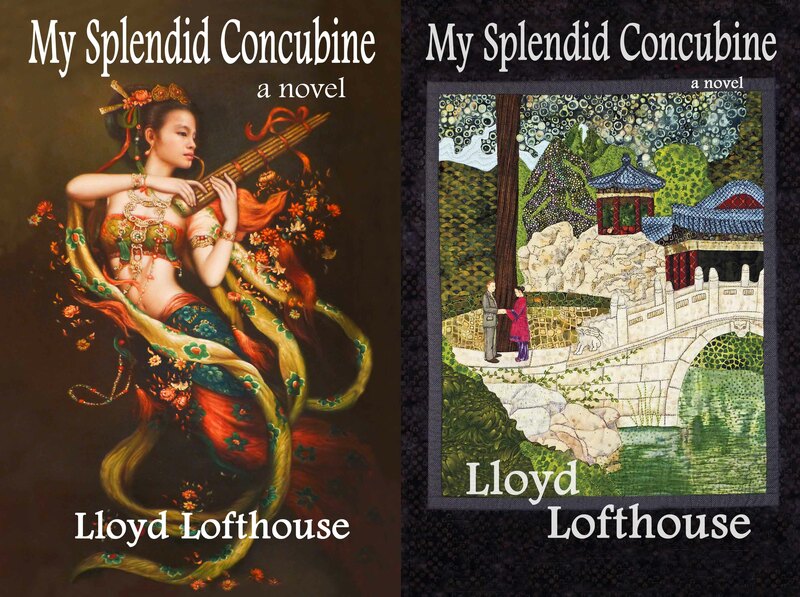 Then My Splendid Concubine earned honorable mentions in three literary contests; Our Hart earned recognition with five awards, and The Concubine Saga, where I combined the first two novels, has picked up another two honorable mentions. I’m going to frame that first one-star review and “hang” it. If you are curious to discover all the reviews and awards covering years 2008 through July 2012, be my guest, visit The Concubine Saga and work your way through the years. Maybe tomorrow readers will stop buying these novels. Maybe my next novel, Running with the Enemy, will flop and never come close to the average. However, no matter what happens, that will not stop this pessimist from setting new goals. By 2020, I want to write and publish a total of nine more novels—that is my next goal and I have seven-and-a-half years or one novel every ten months to achieve it or get as close as possible. In 1968, I completed my first book-length manuscript. Forty years later, I published my first novel. If you want more examples of what it takes to set goals and work hard to make your dreams come true, read Michaela DePrince, dancing a dream and beating the odds and tell me if you do not get tears in your eyes. Discover another role model for setting goals and achieving success by clicking on What do Dolly Parton, Whitney Houston and Jessica Sanchez have in common? For Jessica Sanchez to come in second on American Idol and land a recording contract, sixty-thousand other contestants had to lose.